So you own a Facebook Page and feel a bit fed up of the tiny reach you seem to get with every post you make even though you have thousands of followers. You ask yourself why are my posts only reaching so few people? 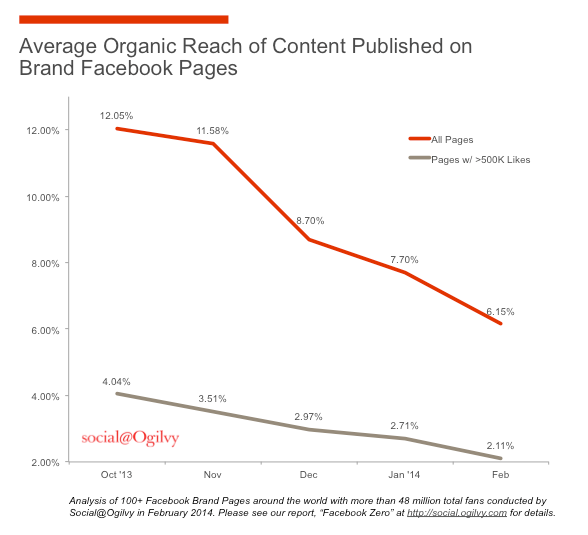 Welcome to the battle for organic reach on Facebook – a digital marketers nightmare. 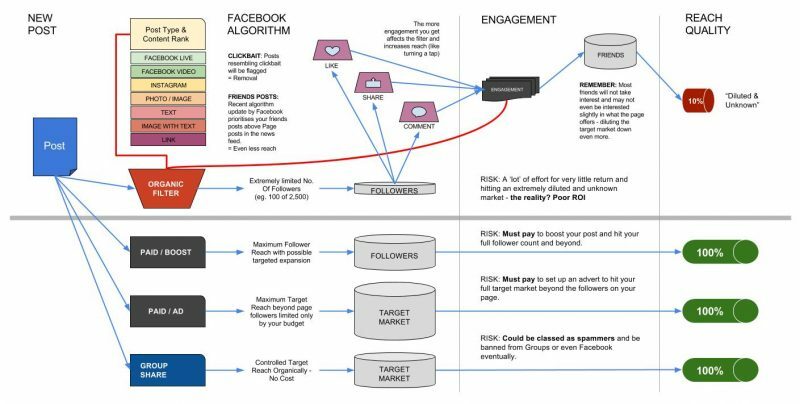 If you choose not to pay for Facebook Ads or to not boost your posts, you are in for a long battle. Maybe numerous battles in an ever-lasting war with Facebook’s organic filter – the news feed algorithm. In the diagram above, this battle is shown in the top half, above the thick grey line. Already it is looking like a long-winded, drawn out battle compared to the flow of the ‘paid’ bottom half in the diagram. Like I said at the beginning, Facebook is reducing free reach on purpose to enforce paid advertisement. At the end of the day, Facebook is a business and requires some form of monetisation especially for the publicly listed investors, so it makes sense on their behalf. If you do want to try Facebook Ads then you NEED a Facebook Page as this is where you advertise from. You can’t run Facebook Ads from anywhere else on Facebook. But beware, remember to track your real conversions or revenue (if you sell products) as a result from Facebook Ads. Otherwise it could end up just being another vicious circle without any rewarding ROI. For example, if you are promoting an item for sale you would hope to see some sales/conversions for your paid advertisement. But what you might find is people on Facebook just aren’t ready to buy or commit yet. They are just there to mingle with friends online. That paid investment could be worthless. For example, lets say you have 20,000 followers but your organic posts only reach an average of 5%. Thats only 1,000 of your followers you reach. Then you work tiressly on improving that reach and manage 10%. Sounds successful right? But in reality you are still missing out on a further 18,000 followers who WANT to see what you have to offer! After all they have committed to actually liking your page. This battle is the biggest frustration a digital marketer can get involved with. Alongside SEO and the other battle for organic ranking on Google, Facebook Page reach is controlled by the ever changing Facebook News Feed Algorithm (previously EdgeRank). Recently, Facebook have implemented a massive change in this algorithm resulting in further reduction of organic reach from a Page post in favour of Friends status updates or their shared posts. So how is the News Feed Algorithm beaten? Well it isn’t unless you pay for ads. But it can be fought against using many found tactics, processes and techniques that are constantly having to be improved upon as Facebook moves the goalposts. Firstly you have to take into account the type of post you are going to share, as certain types rank higher than others. For example, Facebook Live streams are currently the big thing for Facebook which will instantly get you priority reach (for now). Then if you write any text or headings you need to consider what words you are using so the post is not considered click bait and instantly removed or pushed to the bottom of the ranking pile. Another signal is the response rate for your messaging through the Page to your customers enquiring. The faster your response rate the better the ranking your posts will be in Facebook News Feed. If you get past those big hurdles you will still probably only ever reach up to 10% of your pages followers to which you then have to hope upon they engage with the post. Like, Share or Commenting will result in positive reach, but not a huge jump. Like opening a tap up and allowing more through the filter but never fully opened. There are a lot more factors that contribute to the ranking in the news feed algorithm, some that are yet to be confirmed and discovered. Of course even if you get beyond this next hurdle the reach you get might not be to the people you want to target (friends/family of the followers on your page who do not follow your page and probably do not have any interest in your page), making it a totally and utterly pointless exercise for all that effort. The average organic reach found on Facebook for Pages is around 6% if you are lucky. So if we are only reaching 6%, then what is the point in using Facebook Pages, are they dead now? Maybe, but you still NEED a Facebook Page even if you just want to concentrate on paid advertisements. If you don’t want to pay for ads then Facebook Pages still aren’t dead, and the reason is your reputation as a brand or business requires that follower count. Customers today (you probably do it yourself) check a business’ Facebook Page to see how many followers or ‘Likes’ they have to give them a sense of confidence and how popular they are as a business. The Facebook Page follower count is simply a vanity number, but a necessity nonetheless. Facebook Pages certainly aren’t dead, currently I would not recommend spending a lot of time and effort on a Facebook Page, just use it as a minor brand awareness tool. You simply need to increase your follower number to a level that is accepted as reputable or popular then maybe focus more of your efforts elsewhere to get a better ROI. Facebook takes traffic away from your business website. Facebook’s ecommerce platform draws major revenue from your ecommerce efforts. Facebook requires too much time to manage. Facebook requires that you cater to your audience, rather than allowing you to ‘shape’ your audience. Facebook possesses too much control over content and marketing. Facebook fan numbers are misleading. Facebook fans actually consisted of fake profiles. Junk Facebook fans actually damage your brand. Facebook is constantly changing its approach and algorithm, meaning that there is no single best way to engage. Facebook delivers a form of information that is not useful for your audience or customers. Facebook limits the amount of genuine interaction that your audience can have with you. Facebook fans consist of people who actually aren’t customers anyway. Facebook creates negative brand images from people indiscriminately posting negative comments on the company page. Facebook has too many extraneous ads, distracting from the brand’s presence on Facebook. Less is more in marketing. Fewer social platforms means stronger presence where it matters. There isn’t enough actionable data to assess Facebook’s ROI. Facebook does not allow for an integrated marketing effort. Facebook punishes organic posts and non-paid content. Most people are trained to ignore sponsored posts on Facebook; they automatically tune out marketing efforts. There are so many negative aspects when marketing on Facebook. Just because Facebook has billions of users you can target, doesn’t mean that concentrating most of your online marketing efforts on Facebook is the way forward. As you have read above there are so many hurdles to overcome. Keep your eye on the real statistics, your website conversions, your real business goals and the defined ROI, as there are other tools available online that may get you better REAL results. Develop a Social Media Strategy with your digital marketer, this may consist of initially increasing your page likes (the vanity number) to help give your business visibility on Facebook and customer confidence. Then maybe focusing on sharing (and boosting maybe?) high quality and most importantly ‘informative’ content, compared to just posting regular promos or salesy updates organically which usually result in nothing. Marketing on Facebook just seems like a war you aren’t going to win, even if you do pay for advertisements, because it takes too much time, effort and finance to actually gain a tiny slice of REAL success towards your overall business goals away from Facebook. But it’s still a war you need to be part of – just not on the frontline. Needed to compose you that tiny observation to thank you once again for your lovely information you've shown on this page. It has been unbelievably generous of people like you to make extensively what exactly numerous people could possibly have advertised as an e book to generate some money for themselves, even more so now that you could possibly have done it in the event you desired. These advice likewise acted like the good way to be sure that most people have similar dreams just as mine to find out somewhat more with regard to this condition. I am certain there are lots of more enjoyable opportunities ahead for individuals who read your website. I not to mention my buddies came looking at the excellent tactics on your web site and so immediately got an awful suspicion I never expressed respect to the website owner for those strategies. All of the men are already so glad to learn them and already have surely been having fun with those things. I appreciate you for getting indeed accommodating and for getting such helpful tips most people are really eager to know about. My personal honest regret for not expressing gratitude to earlier. I needed to write you one little bit of word to help thank you as before about the breathtaking tricks you've contributed on this page. This is certainly shockingly generous of you to supply easily exactly what most people could have sold as an electronic book in making some profit for their own end, principally since you could have tried it if you ever wanted. These secrets additionally acted like a great way to be sure that someone else have the identical fervor just as my very own to understand great deal more when considering this condition. Certainly there are lots of more pleasant instances ahead for many who looked at your blog. I wanted to write a small comment to be able to express gratitude to you for the fabulous points you are writing here. My considerable internet research has at the end of the day been compensated with sensible facts and strategies to go over with my friends. I would repeat that we site visitors are undoubtedly endowed to live in a very good site with very many wonderful people with very beneficial ideas. I feel rather privileged to have used your entire web pages and look forward to plenty of more pleasurable times reading here. Thank you once again for all the details. I would like to show some thanks to you for bailing me out of this scenario. Because of searching throughout the the net and getting basics that were not beneficial, I was thinking my life was well over. Living devoid of the strategies to the difficulties you have solved as a result of this guideline is a serious case, as well as the ones which might have negatively affected my entire career if I had not encountered your blog post. Your personal training and kindness in playing with every item was tremendous. I'm not sure what I would've done if I had not encountered such a thing like this. I can also at this point look forward to my future. Thanks very much for this skilled and result oriented help. I won't hesitate to endorse your blog to any person who should have tips on this topic. Thank you a lot for providing individuals with an exceptionally terrific opportunity to check tips from here. It's usually so beneficial plus jam-packed with a good time for me and my office peers to search your site at minimum 3 times per week to read the newest secrets you will have. And definitely, I'm certainly astounded concerning the superb opinions you serve. Certain two tips in this article are in truth the most impressive we've had. I must show appreciation to the writer just for rescuing me from such a circumstance. Because of scouting throughout the the net and finding tips which are not helpful, I figured my entire life was well over. Living without the answers to the problems you have resolved by way of your entire review is a critical case, as well as the ones that could have badly damaged my career if I had not encountered your web page. 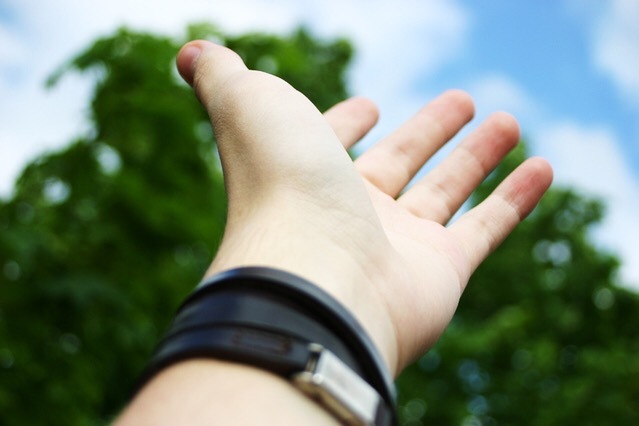 Your personal know-how and kindness in dealing with almost everything was important. I'm not sure what I would've done if I had not encountered such a solution like this. It's possible to at this moment look ahead to my future. Thanks so much for the reliable and amazing help. I will not think twice to propose your web page to any individual who should get guidance about this area. I precisely had to appreciate you all over again. I am not sure what I would have sorted out without the type of thoughts discussed by you on such industry. It has been an absolute hard concern in my position, nevertheless being able to view the very specialised tactic you resolved the issue made me to weep over gladness. I will be grateful for the help as well as hope you recognize what a powerful job you're doing training people today all through your webpage. Probably you've never encountered any of us. Thanks for all of your labor on this website. My mom loves working on investigation and it's easy to understand why. We notice all regarding the dynamic manner you give practical solutions by means of the web site and therefore welcome contribution from some others about this subject matter then my girl is without a doubt discovering so much. Enjoy the rest of the new year. You have been carrying out a wonderful job. I precisely needed to thank you so much again. I'm not certain the things I would have made to happen in the absence of these opinions shared by you concerning my subject matter. This has been a alarming matter for me personally, nevertheless discovering your specialized way you dealt with that made me to weep over fulfillment. I'm just happy for the work and hope you are aware of a great job you have been putting in teaching people by way of your website. I'm certain you've never come across all of us.